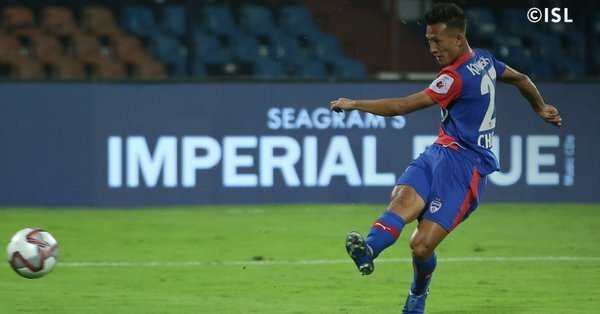 Bengaluru FC (BFC) made a fitting return from the defeat last week against Mumbai City FC by a 2-1 victory in the 2018-19 Indian Super League (ISL) tie against NorthEast United at the Sree Kanteerava Stadium on Wednesday. The win saw the club regain its position at the top of the summit. BFC took the lead with an own goal from Mislav Komorski in the 14th minute but Federico Gallego levelled the scoreline for the visitors after an hour of pay. It was Chencho Gyeltshen who netted the winning goal for the hosts in the 71st minute to send his three-point lead at the top of the table, with five games to go. The match marked the first time that coach Carles Cuadrat had to field a team post a defeat. Xisco Hernandez continued to remain unavailable whereas Rino Anto was back at the right back position. Harmanjot Singh Khabra had to be shifted to the central midfield role. NorthEast, on the other hand, went ahead with an unchanged side that was victorious at home against Chennaiyin. As many as six members of the team have now started each and every game for them this season. A scintillating match of football between @bengalurufc and @NEUtdFC ended up swinging in the favour of the Blues! Now it is up to you to pick the Fans’ Player of the Match from #BENNEU! 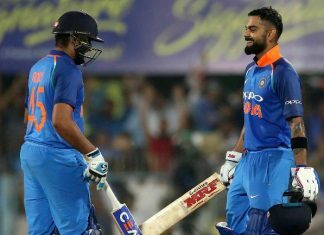 The highly anticipated game started with a bang with both the sides surging forward. There were frequent set-piece routines in the build-up to the first goal. In one of those free kicks, it was Dimas Delgado who rolled the ball to Sunil Chhetri in a well-balanced arc. The Blues skipper then chipped the ball to an onrushing Udanta Singh on the right side of the box. The Indian winger then struck a powerful volley just inside the box. The ball took a deflection on its way to the goal off Federico Gallego. Defender Mislav Komorski, who was attempting to clear, instead ended up slamming the ball into this own net. This was not Komorski’s evening, it seemed, as the NEUFC player almost scored another horrendous own goal three minutes past the half-hour mark. Erik Paartalu headed the ball across the face of goal towards Udanta. The latter then diverted the ball with a grounded shot from the far post. Quite comically, Komorski almost stuck a leg to put another goal past his own net along with Chhetri failed. Nonetheless, the Highlanders were the dominant force coming towards the end of the first half. They frequently came up with serious attacks to terrorize the Bengaluru back four. However, the score remained 1-0 in the hosts’ favour. NorthEast’s sustained attack bore fruit exactly on the hour mark, three minutes after a controversial but unsuccessful penalty appeal when Gurpreet brought down Ogbeche in the 18-yard box. Gallego correctly anticipated the lofted pass from Robert Lalthlamuana and ran right through Bheke and Juanan. He then took a calm right footed shot which saw the ball go through Gurpreet’s legs and then into the back of the net to level the matters. With over half an hour of play still to come, the game was very well open on both the sides. The hosts’ defense remained on their toes throughout the match with Ogbeche making enterprising runs on more than a few times. In an anticlimax, Bengaluru smartly took advantage by NEUFC with Chencho deciding the matters once again. Bheke started the whole process with his throw-in that was flicked into the box by Juanan. Reagan Singh failed to mark his man and the Bhutanese international pounced on the opportunity, tapping in the winner comfortably. BFC was always going to settle back with the one-goal cushion at the back. Goalkeeper Gurpreet was solid at the back, as he denied an impressive Ogbeche with three massive saves towards the end. NorthEast United remained third with 23 points, seven behind the league leaders but FC Goa, just two points and a place below had two more games in hand over the Guwahati-based outfit.